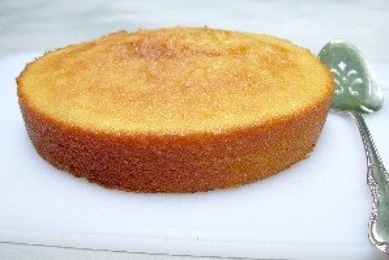 Vanilla Cake Recipe makes an old fashioned yellow cake from scratch with self-rising flour. Whip up this simple layer cake almost as quick and easy as a boxed mix. Make delicious Chocolate Frosted Cake, Pineapple Layer Cake, Birthday Cake, Boston Cream Pie, Strawberry Shortcake or cupcakes. Use the frosting suggested below or another favorite. Be creative with this simple cake. For party themes add different flavors to the batter. Or divide the batter and color each layer. Add a few drops of food color to the icing. Included is a Decorator Icing recipe. Take the refrigerated ingredients out of the refrigerator until they reach room temperature. Cream butter and sugar together in mixer on high speed, until light and fluffy. Cream in corn syrup and vanilla flavoring. Mix in flour and milk (fold in by hand or mix on medium speed), alternately a little at a time, starting and ending with flour. Do not over beat. Do not beat more than 1 minute after all flour is added! Pour mixture into two 8" or 9" prepared* baking pans. Bake in preheated oven 350F. for 20-25 minutes, until done and lightly browned. Cake is done when a toothpick inserted into center of cake comes out clean. Also, the sides will start to loosen around edges of pans. Do not over bake. (One secret to a moist cake!). *To prepare pans, grease bottoms and sides. Sprinkle lightly with flour. Cover bottom with a circle of waxed paper. Grease paper and sprinkle on flour, shaking out excess. This helps the paper to be peeled off after removing layers from pan without taking too much of the browned bottom crust. A simple vanilla cake be can be dressed up by filling with fruits and topping with whipped cream, or frosting with your favorite icing. The Creamy Chocolate Frosting is excellent for this moist yellow cake. Add 1/2 teaspoon pecan flavoring or fold in 1/2 chopped nuts of your choice to make a delicious, moist yellow cake. For a Birthday Cake, you may use the icing recipe below. Mix on medium speed in mixer until creamy and stiff enough to pipe through a decorating tube to hold shape. If using this icing to frost cake use a little more water to make it a spreading consistency. This Vanilla Cake Recipe makes two plain cake layers that can be made ahead, thoroughly cooled, placed in a freezer zip lock plastic bag (I use the gallon size), and frozen for up to a month. To use, remove from freezer bag, place on a cake plate to thaw at room temperature. Can be used partially thawed enough to cut into slices and served with ice cream, fruit or other favorite toppings. This makes a nice dessert when unexpected guests pop in.